Sometimes the simplest ideas are the best. This sturdy, yet lightweight pen will write for you and it may save your life by giving you the edge in a physical encounter. By having it with you all the time, you will not leave it behind and it can be in your hand when trouble strikes. For example, should you be accosted and they try to force you into their vehicle. You know its trouble ahead and must fight to stay free. Well, your strikes, punches and jabs can be made more effective with this pen in your fist. A swipe and twist in their face will make them let go and allow you to run for safety and call for help. 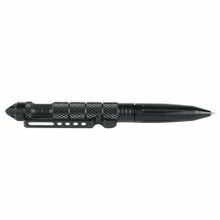 This pen has a black finished textured aluminum body for easy grip with glass breaker tip and a large pocket clip for easy carry. It has a retractable pen tip, twist to open and close. Writes well and comes with a replacement pen ink cartridge. It can be used in a self-defense situation to jab or stab or slash. Pen Measures 6 1/4" x 1/2"